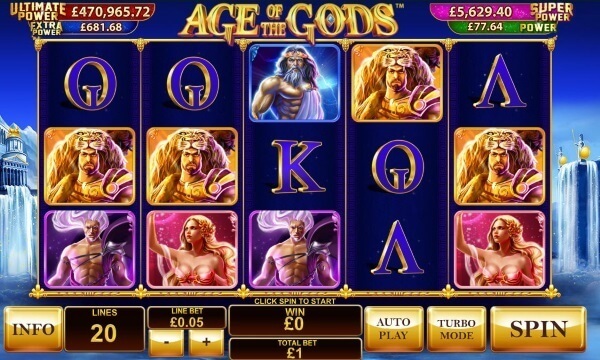 Age of the Gods slot is a 5 reel, 20 paylines progressive jackpot slot game powered by Playtech. Age of the Gods is based on ancient Greek mythology, specifically; the game features 4 Greek gods: Athena, Zeus, Hercules and Poseidon as its main characters. Each of the gods has distinct characteristics and is represented in their own free spins feature. This slot game utilises the Turbo Mode enabling players to spin the reels at a faster than normal pace. In the Age of Gods, the main symbols include all the gods- Athena, Zeus, Hercules and Poseidon. Of all the gods, the goddess Athena is the highest value symbol. Landing an Athena symbol rewards you with 1,000 times your line bet for 5 on an active payline. The highest value symbol is the wild (laurel wreath). This symbol substitutes for all symbols except the scatter. Landing a wild rewards you 10,000 times your line stake for 5 on an active payline. Age of the Gods has a number of bonus rounds that players can enjoy. Here all the four Greek gods have to appear successively on an active payline starting from the first reel. Your reward will be 200x your line bet or 10x your wager as a cash prize. This bonus feature is triggered by landing three or more Age of the Gods symbols on the reels during the main game. Twenty Age of gods coins will be displayed on a wall. Matching any three similar god coins gives you access to play the corresponding free spins feature. Even though each feature has unique characteristics, all will begin with 9 free spins. 1. Athena Free Games feature. Here you will have nine Athena free spins. Before each free spin you will receive a random multiplier for the next free spin. This multiplier can be between 2x and 5x. Once this feature terminates, it can’t be retriggered. 2. Zeus Free Games feature. 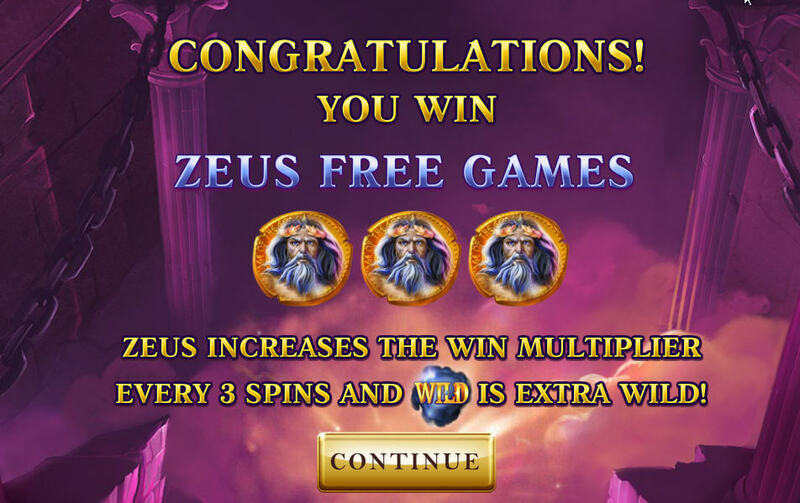 Here you will have nine Zeus free spins. The wild will be locked in the middle position of the mid reel to enhance winnings. The game will begin with a 1x multiplier and after every 3 free spins, the multiplier by 1. This implies that the 4th to 6th spins will be subject to a 2x multiplier whereas the 7th to 9th spins will be subject to a 3x multiplier. Once this feature terminates, it can’t be retriggered. 3. Poseidon Free Games feature. Here you will have nine Poseidon free spins. Poseidon will shoot a lightning bolt from his trident converting a max of five symbols on the reels into wilds on every single free spin. You can win up to 7,000x your wager on each spin. Once this feature terminates, it can’t be retriggered. 4. Hercules Free Games feature. Here you will have nine Hercules free spins. The Hercules symbol substitutes for all symbols except the scatter. You will realise that this symbol is frozen on the middle reel to improve your odds of winning. Once the free spins feature terminates, you will be taken to the wall to pick more coins. You will be allowed to explore various game features until you reveal the Hades symbol. There are 4 progressive jackpots up for grabs in Age of the Gods( Same as in the Marvel Jackpot Slots) These are the Power, Extra Power, Super Power and Ultimate Power Jackpots. All 4 jackpots are triggered randomly. Immediately after winning the jackpot feature, the jackpot game will commence. A 4×5 grid consisting 20 squares which conceal different jackpot symbols will appear on the screen. Revealing 3 matching symbols wins you the jackpot!